Author James C. Tanner sets two seemingly impossible yet worthy goals with his book: to explain the massive U.S. tax code in laymen’s terms and to propose workable, comprehensive and fathomable reforms. Considering that Americans face a 73,000-page code so befuddling that they spent some $160 billion on accountants in 2014 to try to comply with it, that’s quite a challenge. Incredibly, Tanner is more than up to the task. Tanner eschews the bold and complete rewrites of the tax code that some advise, such as a flat tax or a national sales tax. Instead, he proposes a piecemeal approach that he calls the “20/20 Tax.” It’s based on a new rule that most taxpayers would have a tax rate of no more than 20%, while the highest income earners would see a top rate of 30%, and that almost all deductions and credits would be applied at a consistent 20% rate. He asserts that his reform would be fairer than the current system, easier to understand, simpler to follow, politically palatable and conducive to economic growth. It’s an interesting and credible idea, worth reading and debating. Tanner helps his case with clear, precise and sometimes entertaining writing—not what you might expect from a certified public accountant. And while his text is thorough enough to please tax experts, it will go a long way to enlighten laymen brave enough to wade into the swamp of deferred gains, depreciation, upside-down subsidies, GRATs, GRITs and GRUTs. No, it’s not light reading, or a dummy’s guide to taxation. It is meant for those who are serious about understanding the complexities of the income tax code and who wish to add their voices to the current public debate over reform. As the tax code continues to come under fire from political candidates, tax experts and taxpayers, Tanner’s book is a noble and useful endeavor. 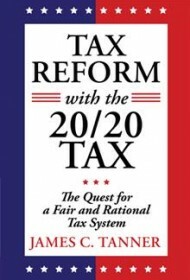 It offers a valuable comparison of current tax regulations, proposed reforms and the author’s own “20/20” proposal and is highly recommended for anyone seeking a solid understanding of the tax code.